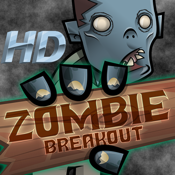 "Zombie Breakout HD" is for all Halloween and Horror fans that love Zombie Games! Are you ready to crush zombies? Hollywood sound designers have created an entertaining and stylized zombie sound effects atmosphere for everyone to enjoy. This game was strategically designed to keep you and your zombie friends busy for hours and hours. These zombies are angry and tired of being in the dirt. They're ready to breakout of their caskets and escape. It's your job to save the planet and keep them deep in the ground. Watch out for the hand, it's fast! Crush the zombies before they breakout and earn 100 Zombie Bones for each zombie you smash. Make your way to the top of the Zombie Leaderboard with the most Zombie Bones. As the level increases, the speed and number of zombies also increases. Your strategic "crushing" and "smashing" skills are required! Don't let the zombies breakout. Crush 'em all! Sign in with Game Center and compete against your friends, family and the world! You don't have to worry about entering your high scores, because we take care of that for you. Every time you crush a zombie, your score is automatically submitted to Game Center. Press the "Leaderboard" button and make your way to the top of the "Zombie High Scores" list. It's that easy! Bring the rest of the zombie gang to life and get so much more by "Unlocking Zombie Friends!" Purchase once and crush them over and over again. Unlock to get the Zombie Soundboard filled with a variety of Zombie Sound FX Tracks. Everything from deep moans, angry growls, hisses and spooky background noises. Purchase once and play them over and over again. As an added bonus, we've also included 10 FREE Zombie Ringtones for you! Set them to a specific caller or all your callers. You only have to purchase Zombie Tracks once. Sync with iTunes and onto your iPhone. Unlock to get super vibrant and colorful High-Definition Zombie Wallpaper images for your device. Set them as your background home screen or as your lock screen. With an easy "save" button, your wallpaper is saved directly into your Photo's album folder. Purchase once and use over and over again. It's that easy!